The Moss Arts Center. Courtesy of Virginia Tech. We keep this fifty-year-old adage in mind during the first Studio Heads meeting of the Institute for Creativity, Arts, and Technology (ICAT) inside its $90 million building, designed by Snøhetta. We earned our seats at the table of Virginia Tech’s new organization “at the nexus of the arts, design, engineering, and science” by convincing its director, Benjamin Knapp, that humanists also can be applied researchers.3 Kari, the project’s ethnographer, distributes IRB forms that some sign with a passing glance and others parse skeptically. She has just arrived in rural Virginia from Vienna, Austria, where she worked as an aerospace engineer. Matt, a historian and ICAT-funded fellow, has been lurking at maker camps and grant proposal sessions throughout the summer in the institute’s temporary home in Collegiate Square, a local shopping plaza. Queasiness permeates the conference room. Two overlapping events are swiftly approaching. First, the grand opening of the Moss Arts Center4 (MAC), in which ICAT will have second billing to the building’s larger resident, the Center for the Arts (CfA). The celebratory week will feature an open house, a performance of Philip Glass’s Powaqqatsi, and a ribbon cutting. The second event, Tech or Treat, is a Halloween showcase of ICAT’s fusion of playful collaboration with its land-grant mission. While we struggle to keep up with rapid-fire references to people and projects, the small group of digital artists, computer musicians, educational researchers, dance professors, electrical engineers, and managers debate seemingly endless challenges. From contractor blunders to equipment that has yet to arrive, little is going according to plan. Much of the conversation focuses on using a project called Mirror Worlds as a signature demonstration of ICAT. Mirror Worlds seeks to install sensing arrays in the MAC lobbies, galleries, concert hall, and research studios. Optical and infrared cameras will collect, process, and represent data in “bidirectional conduits between the real and virtual worlds.” 5 Ideally, everyone will be able to access these “living labs” and in turn will be analyzed for the advancement of knowledge. The question in the meeting, however, is whether Mirror Worlds might provide momentary entertainment for gray-haired donors and costumed children. More accurately, the question is whether it will work at all. Interactive map of a2ru partners. Courtesy of the Alliance for the Arts in Research Universities. Architecture and the 'Creative Economy.'. Here we focus on one major thread—the interaction between ideals and practices of arts research and the efforts to establish infrastructure to support it.6 Our larger inquiry spans design pedagogy, the rise of “STEAM” education, the lived experience of interdisciplinarity, the cultural meanings of innovation, and the politics of technoscientific institution-building. We point to this institution building in part because it is easier to describe arts research infrastructure than it is to capture the myriad perspectives of what constitutes “research” in these environments. Infrastructural studies, moreover, demonstrate the power of systems to reshape material and cognitive interactions.9 Thousands of professional and apprentice artists, designers, engineers, and scientists are being drawn into transdisciplinary collaborations with substantial opportunities and risks that challenge institutional norms, practitioner identities, and research practices. Our analysis looks beneath the rhetoric of a natural symbiosis to focus on everyday experience. To link local subjectivity with global patterns, we combine in situ descriptions of ICAT and its projects with historical and contemporary surveys of arts research institution building. Doing so focuses attention on the evolving meanings and practices of transdisciplinary arts research and on how researchers (ourselves included) continue to volunteer for these experiments. The “Sandbox” after move-in day. Photo courtesy of Kari Zacharias. Field Notes: Community Playdate. Zacharias & Wisnioski, November 1, 2013. Instead of the usual relaxed chatter over muffins and coffee, a tour begins. We’re standing in the MAC lobby with thirty colleagues and strangers for a “community playdate,” one in a weekly series of public meetings at which ICAT faculty, graduate students, and grant recipients discuss their work. We enter the “Sandbox,” which Knapp introduces as a configurable environment “just like” ICAT’s former premises at Collegiate Square. Everything is on wheels. The open room provides workspace for graduate students and flexible options for project meetings, presentations, and installations. We will soon set up our own cluster, claiming a pair of tables and the room’s only bookshelf. “Welcome to the white innovation pit of despair,” scribbled on a whiteboard, announces the room’s contrast with the mix of electronic parts, conversations, discount sofas, and general disorder that the graduate students loved about the “real ICAT” at Collegiate Square. The new space is lit with overhead fluorescents and a giant window from the second-floor hallway, through which passersby can peer down on research in action. As we proceed through the ground-floor studios, it’s clear the building is still under construction. In the Create Studio, a prototyping lab, a MakerBot 3-D printer sits on a table, and a workbench covered with soldering kits and multimeters runs along the wall. Otherwise, it’s just boxes and half-installed machines. Tom Martin, the engineering professor in charge of the studio, apologetically tells us that a bigger 3-D printer, a laser cutter, and electronic prototyping equipment are on their way. The Perform Studio, a space for motion capture has twelve infrared cameras and twelve wall-mounted speakers installed, with twelve more on order. No one can get the sophisticated light switch to turn on. Down the hall, we are barred from most of the Experience Studio because the occupancy certificate currently covers only half the room. The “Cube.” Photo courtesy of Virginia Tech. Our next stop is the “Cube,” the MAC’s showpiece performance space and interactive acoustic laboratory. Inside the dark walls a group of artists and technicians are busily setting up an audio–video installation in time for morning visitors. Eventually, more than one hundred speakers will be mounted in different parts of the room. Seen through a head-mounted display, Knapp explains, the immersive sensory environment will create a complete virtual world. We continue through the CfA’s Performance Hall, where preparations are under way for Philip Glass, and into the Learning Studio, the new home of ICAT’s K–12 education research and outreach work. Soon the Learning Studio will host maker camps, extracurricular design club meetings, elementary school field trips, and university classes for undergraduates and graduates. The space also can be used for observation: two cameras already are installed, and, the refrain goes, more are on the way. 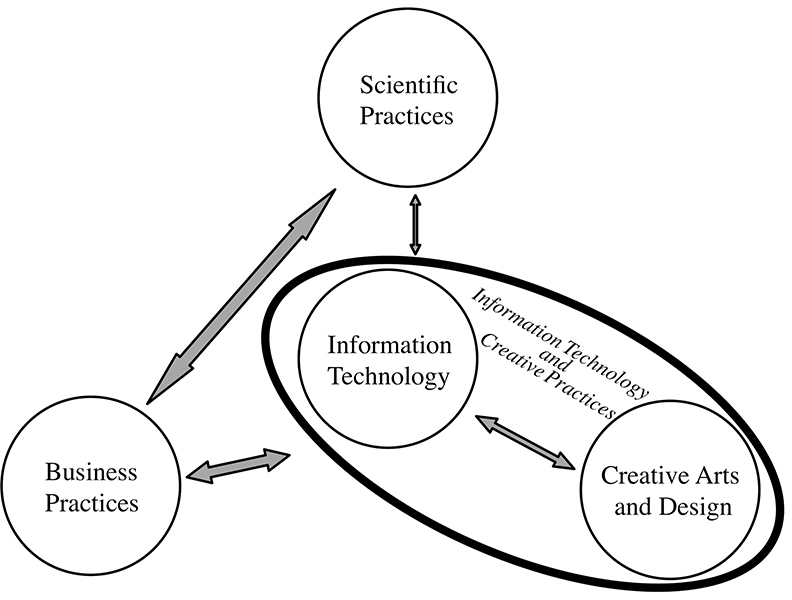 Information Technology and Creative Practices. Reproduced with permission from Beyond Productivity: Information Technology, Innovation, and Creativity, 2003 by William J. Mitchell, Alan S. Inouye, and Marjory S. Blumenthal. Courtesy of National Academies Press, Washington, D.C. Architecture and the 'Creative Economy.' entanglements in the 1960s and 1970s.10 It included now canonized organizations such as Experiments in Art and Technology, MIT’s Center for Advanced Visual Studies (CAVS), Stanford’s Center for Computer Research in Music and Acoustics (CCRMA), research at Ohio State and Bell Laboratories in computer graphics, and the arts research journal Leonardo. Left, CAVS, Centerbeam, National Mall, Washington, D.C. 1978. Photo: Dietmar Lörhl. Courtesy Of Center For Advanced Visual Studies Special Collection, MIT. Copyright Massachusetts Institute Of Technology. Right, CAVS, Centerbeam Section, 1977. Courtesy of Center for Advanced Visual Studies Special Collection, MIT. Copyright Massachusetts Institute of Technology. Two visions for the future of transdisciplinary arts research at MIT. Left, Lyndon Associates, Places for the Arts at MIT, 1978. Copyright Massachusetts Institute of Technology. Right, The Wiesner Building. Courtesy of Madcoverboy at en.wikipedia. The current infrastructural boom began in the late 1990s. Not simply a hybridized version of its predecessors, this third stage is notable for its scale and diversity. Much discussion of the technological arts has explained the remarkable expansion as a natural convergence of technological and cultural forces.19 However, coordination is one of its most important characteristics. Two major advocacy reports provide a glimpse into the movement’s motivating forces and spotlight its persistent tensions. Both released in 2003 after years of data collection, the reports emphasize the political dynamics between artists and technologists in visions about how arts research ought to be constituted. The first, “Truth, Beauty, Freedom, and Money,” was a brisk art-world manifesto. Written for Leonardo by media artist Michael Naimark, it evoked the utopian realism of Kepes in a call for a new kind of “Arts Lab,” a not-for-profit “hybrid art center and research lab” supported through grants, donations, and corporate consulting.20 The Arts Lab would draw on technological research practices via three mechanisms: an Artist Patent Agency, an Artists Editions Agency, and an Artist PR Agency. Research as a place apart. as the central feature of cultural and economic growth, and arts- and design-based skills as crucial for American IT professionals to remain at the forefront of global change. Though the place of the artist versus the technologist and the ends of the interaction differed widely in these studies, both were supported by the same patron, the Rockefeller Foundation. Both looked longingly to state-funded models in Europe and Asia, and both emphasized research as the convergence point between artists and technologists. “Emerging Creatives.” Photo: Yuto Watanabe. Courtesy of the Alliance for the Arts in Research Universities. The nametag they gave me says “Wayfinder,” but the first thing I do is get lost. Citrus trees and flowering bushes remind me that I’m a long way from the Blacksburg winter. Thanks to last-minute program changes and misplaced signs, I arrive a few minutes late. I skirt around an outdoor sculpture garden and hurry in. It’s the first day of the inaugural a2ru student conference, and my fellow wayfinders are arranged in a circle. Through the introductions, I discover that we range from college freshmen to PhD students and span disciplines from engineering to psychology and dance. We’ve been matched because we chose “general problem solving” from a list of reasons for collaborative work over entrepreneurship, social justice, “arts and hacks,” or personal and professional growth. Over the next two days, we will divide into smaller working teams to identify issues and develop project proposals related to our theme. At the conclusion of the conference, one working team from each session will present their idea to the plenary. At first, we’re confused and dismayed by the lack of specific instructions. Several people float vague project ideas to vague response. Eventually, someone points us to the expanse of whiteboard covering an entire wall. Markers are procured. Brainstorming begins. After a few minutes the wall fills up with project ideas. We divide again, this time into three groups. The largest group offers the “Idea Train,” an expandable mobile workspace that travels between communities and universities to provide infrastructure for collaborative design projects. Another team suggests an art installation that uses human-powered vehicles to light an LED display in a public park. Inspired by the experiences of an Egyptian team member, my group sets out to design a Web interface that facilitates crosscultural communication and helps travelers avoid making faux pas. Research as a place apart.. Between these activities and during meals, we are scheduled to “network.” Although few business cards are exchanged, conversations erupt and continue by the hotel pool well into the night. On the final day, project groups choose their representatives to share their work with the full conference. We frantically finish our written proposals and create prototypes. We discuss. Vote. Discuss. Vote. Vote again. Among the wayfinders, the Idea Train wins. My team members are disappointed, but I secretly am relieved that we won’t present our slapdash PowerPoint-based prototype in front of so many discerning “creatives.” All week, I’ve battled the impression that I’m not creative enough to have earned my spot. We’ve heard a lot about music and theater, design and media arts. Writing seems too old-fashioned to matter. The student presentations are uniformly impressive. The arts and hacks team entertains us with a mobile app that predicts how much closer your daily activities have brought you to death. The would-be entrepreneurs use showers of confetti to supplement their proposal for a luxury airline that facilitates collaborative work. The social justice group creates a moving performance piece about federal funding for the arts. Leila Kinney, executive director for arts initiatives at MIT, gives the closing address alongside a group of MIT students. Together, they offer an overview of the arts at MIT. The projects they speak about are fascinating, but the contrasts between the Stanford sculpture gardens, the d.school’s “design thinking,” and MIT’s conception of the “useful arts” are striking. In the days and weeks following the conference, we receive emails from the organizers with links to a2ru social media groups and requests for our reactions to the event. These responses, blog posts, and student newspaper articles are collected and enthusiastically displayed as part of the “Knowledge Base” on the a2ru website, along with descriptions of the student projects.24 . Back in Blacksburg, the three other Virginia Tech attendees and I give a playdate talk about our experiences. I’m not sure what to say. I try to focus on the varied kinds of arts research I encountered over the weekend. Inevitably, the first question from the audience is where ICAT fits within this national scene. That, I think to myself, is what I’ve been trying to figure out this whole time. ICAT’s mission. Courtesy of ICAT. A critical mass of networked peers is a defining strength of today’s arts research boom and a central challenge to individual institutions. Collective demonstrations are important for advocacy efforts, but it is vital for organizations to stand out. Doing so requires constructing narratives that satisfy multiple stakeholders and reflect local history and culture, national policy initiatives, global patterns, and the combined experiences of ever-changing participants. 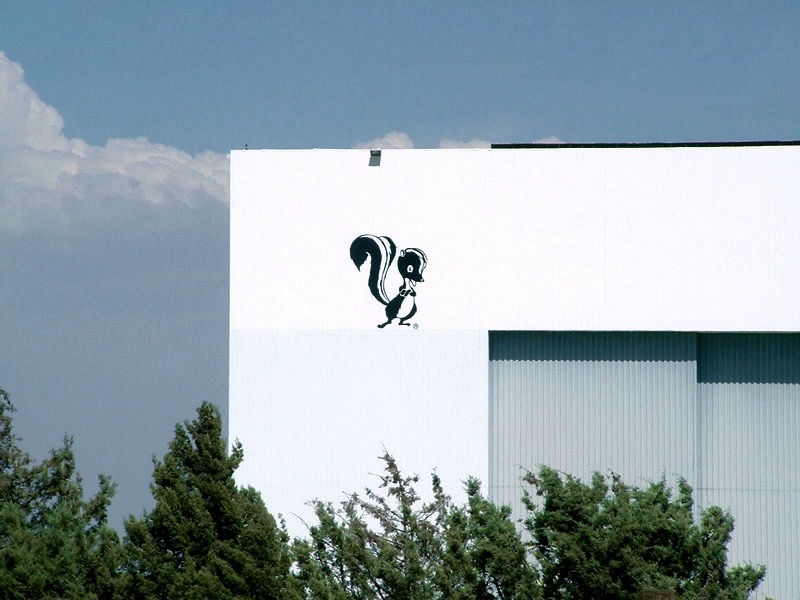 At Virginia Tech, ICAT was founded in 2011 as the research partner to its cultural counterpart, the CfA. The result of a decadelong commitment by senior administrators to enhance the university’s reputation as a “comprehensive” global institution by expanding the arts, it was built on an earlier cluster hire for the Collaborative for Creative Technologies in the Arts and Design and smaller precursor organizations such as the Integrated Design + Education + Arts (IDEA) Studio. ICAT reflects Virginia Tech’s status as a land grant organization enmeshed in a global innovation economy. Befitting its heritage, ICAT’s return on investment is measured in the domains of education, research, and engagement. ICAT highlights its educational research as a national strength. But it also devotes resources to community involvement and is partnering with organizations such as the National Science Foundation’s Innovation Corps to foster a regional innovation network that includes NuSpark, a free, collaborative workplace for entrepreneurs that opened in ICAT’s prior shopping plaza location. The ideal ICAT project blends the institute’s tripartite mission seamlessly. For example, the recent OPERAcraft saw local high school students write an operatic libretto, build virtual characters and sets in Minecraft, and perform their piece alongside student singers from Virginia Tech’s department of music. Lantern Field, an interactive architectural installation at the Smithsonian’s Freer and Sackler Galleries, combined paper lanterns folded by museum visitors with a responsive lighting and sound system configured by ICAT students and faculty. Where peer institutions lean toward one side or the other of the arts/technology spectrum, or focus on a set of specialized research thrusts, ICAT thus far has pursued a catholic vision of transdisciplinary arts research. Its principal criteria for funding projects are the involvement of researchers, concepts, practices, and outcomes from at least two of its quadrants of art, science, engineering, and design. This broad policy is in part an artifact of ICAT’s position as one of seven research institutes that reside outside the university’s system of colleges. As such, it is neither beholden nor immune to any faction of architects, artists, designers, engineers, musicians, scientists, center directors, or deans. ICAT’s director reports to the provost and a cross-college advisory board. Finally, this open-ended vision stems from building a human infrastructure around existing faculty, a necessity of the institute’s surprisingly small budget. Knapp and a staff of three manage the business and daily operations of ICAT and coordinate its vision with a core group of studio heads, while students and other associated faculty receive project-based funding and volunteer their time at institute events. Much of ICAT’s first two years was spent identifying who on campus might be interested, who might “gel” in the environment, and what projects they might pursue, as well as smoothing over relationships with individuals and departments to make it happen. Not surprisingly, these diverse aims and stakeholders generate frequent tensions and conflicts. Participants come with various pictures of what ICAT is and what it should be doing. “Hybrid” researchers whose work spans multiple disciplines struggle to define the value of ICAT projects to their academic peers and tenure committees. Researchers are thrust into the open-concept, collaborative Sandbox. Artists fight to be considered equal partners in technological research. ICAT and the CfA face high demand for a shared set of physical resources and differing levels of financial support and community recognition. Negotiating among these various resources, desires, and expectations runs throughout ICAT research projects. Mirror Worlds Technological Infrastructure Map. 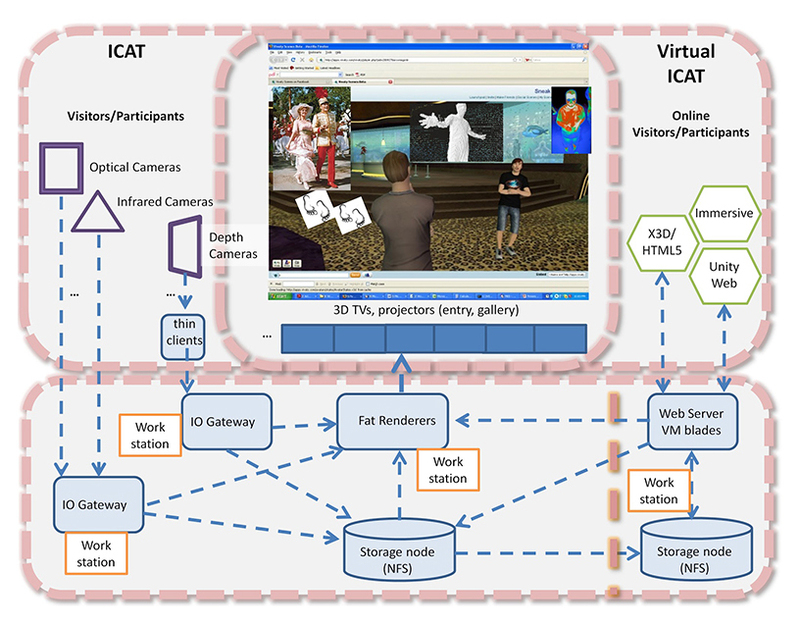 Reproduced with permission from NSF Grant Proposal 1305231, “Living Lab for Asynchronous and Synchronous Investigation of Virtual and Real Environments” by Benjamin Knapp, Ivica Bukvic, Yong Cao, James D. Ivory, and Nicholas F. Polys. Courtesy of ICAT. Field Notes, Multiple ICAT Sites. Zacharias & Wisnioski, October 30, 2013–April 4, 2014. Soon we will invite the public inside. The Cube has been transformed into an interactive labyrinth of smart fabric “trees,” 3-D-projected monster heads, skeleton-themed Kinect games, and flying robots. In the lobby, cameras will track visitors and display their likenesses on the wall as shimmering blue “ghosts.” Dane Webster, ICAT studio head and the artist responsible for the projection, paces nervously. His own ghost flickers and glows. The Mirror Worlds demo dominates the lobby. Kari spends several minutes experimenting with it. She finds the edges of the camera’s field. Speeds up and slows down—her avatar keeps pace. Stands still and waves her arms—this time, no reaction. The virtual form is only partially holiday-themed. What were originally humanoid projections have been changed to “wonderfully nebulous” shapes to ease concerns that people will feel “like they’re being watched.” The idea is to take this lesson into the future development of the project. Unfortunately, due to an extraordinary number of visitors, the collective image is a mass of specters waiting in line. A week after the MAC’s opening, an exhausted Knapp described the outcome as “perfect.” The prototype entertained the overflow of nearly eight hundred children and parents and later caught the attention of symphony goers. It is now six months on, and though he promised the studio heads that the pace of demonstrations, development tours, and planning retreats would taper, such events continue to dominate ICAT’s daily activity. Both excitement and doubts exist about the future of Mirror Worlds. The team is still in the first semester of its two-year grant. Undergraduate students employed as project managers and technical specialists plan to scale up the infrastructure one room and hallway at a time. They work enthusiastically in the Sandbox, which now boasts carpeting, table lamps, and a lived-in atmosphere. Graduate students have claimed their own workspaces and filled them with computers, books, coffee machines, and virtual-reality headsets. They still grumble about the lack of natural light, but no one talks about Collegiate Square. For his part, Webster is concerned about the planned scale of the project. A “build it and they will come” attitude persists at ICAT, but Webster and others are wary of building infrastructure before conceptualizing its use more completely. 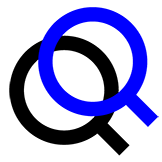 Other stakeholders praise this aspect of the project, citing the open-endedness of Mirror Worlds as the “exciting” part. Related tensions exist between the infrastructure’s perceived artistic and scientific values. An artist ruefully recalls a conversation from an early phase of the project, when a computer programmer was dismayed to discover that the visual representations “have to look good.” The Mirror Worlds grant proposal suggests several technical and research outcomes but makes no mention of art. In conversations with project team members, suggestions of artistic outcomes range from informing “public engagement of space” to offering new interpretations of the MAC’s architecture, but everyone acknowledges that these goals are nebulous. For Knapp, the aesthetics of the project are in the interaction itself. Exploring new representations of communication across the physical/virtual divide will help create a “nurturing” environment inside the modern, white-walled MAC. Mirror Worlds: From Solid Bodies to Ethereal Ghosts. Left, Early Mirror Worlds rendering. Courtesy of Dane Webster. Right, Mirror Worlds at Tech or Treat. Courtesy of ICAT. Fifty years into the construction of a natural symbiosis, where do we stand? Juxtaposing infrastructural growth at time scales of a half-century and half a year, however, shows that something new is happening. As ICAT grows, so too do other institutes across the country and around the world that are process—rather than goal—based. Future architectural historians likely will write volumes about the qualities of “statement” facilities for fostering or hindering innovation. Universities are becoming crucial sites for training hybrid researchers who in earlier generations created their own paths or traveled through a tiny group of elite institutions. Researchers in these environments also are being transformed by their participation, and not without risks. For our own part, as we share these reflections, we wonder how our home department will interpret our potentially “compromised” criticality and how our participation in ICAT will be altered as we draw on our colleagues as research subjects. Matthew Wisnioski is associate professor of STS at Virginia Tech; a fellow of the Institute for Creativity, Arts, and Technology; associate director of the Human Centered Design IGEP; and a 2014 fellow of the Smithsonian’s Lemelson Center for the Study of Invention and Innovation. The author of Engineers for Change (MIT 2012), he is working on his second book Everyone an Innovator funded by NSF Scholar’s Award 1354121. http://www.sts.vt.edu/faculty/wisnioski/. Kari Zacharias is a PhD student in Virginia Tech’s Department of Science and Technology in Society and a graduate assistant at the Institute for Creativity, Arts, and Technology. Her research examines contemporary art-technology research institutes and their relationships to technical education.